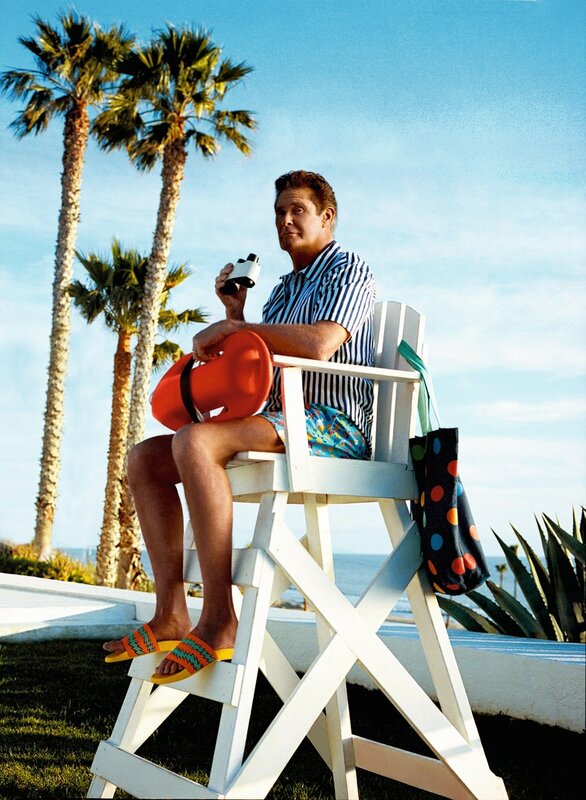 Obviously, the former Mitch Buchannon — lead lifeguard and slo mo running-on-the-beach hero from the international phenomenon series “Baywatch” — would be the ideal star for the Swedish brand’s spring/summer campaign celebrating the launch of colorful and print-happy swimwear and beach accessories. 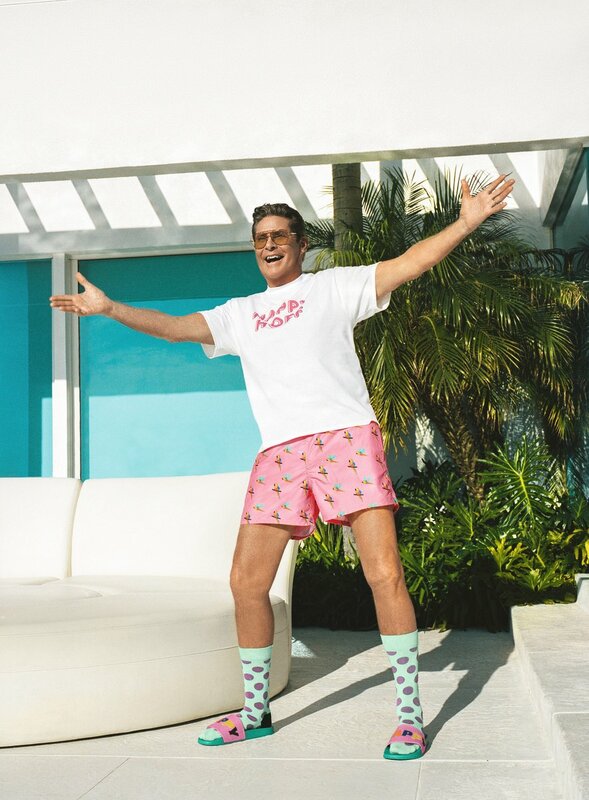 Hasselhoff selected his favorites for supporting roles in the lively campaign video, which also pays homage to his globally-famous roles and enduring influence, not just on pop culture, but also democracy in the Western world (see: Hasselhoff’s 1989 Berlin Wall concert). Here are the wonderfully bonkers highlights. Are you wearing the polka dots shorts? I heard they’re your favorite. I put the turquoise and orange ‘shazam’ ones on. I have so many. They sent me a whole bunch. I asked my assistant to just throw in everything with Happy Socks. My bag is full of different bathing suits — a lot of bathing suits — and the dots are my favorite. The colors, they just make you happy. It’s funny because a lot of my attorneys in New York are all big fans of Happy Socks, so it’s a marriage made in heaven, actually. So what brought you and Happy Socks together? Well, they called me and offered me this campaign and I said, ‘What’s Happy Socks?’ and then I went into Selfridges in the U.K. because it was around Christmas time. I can only go there before 11 o’clock because it gets too crowded and I have to leave because people come over and they want a selfie. I said, ‘I gotta leave’ and then, I go, ‘oh my god, what’s that? !’ and it’s a gigantic tree of Happy Socks. And I saw the colors and I went, ‘This is perfect.’ So I got on the phone, called them up and said, ‘I’m in Selfridges with a Happy Socks Christmas tree and the answer is yes, let’s do it.’ I just love the colors. A long time ago, I had planned on coming out with some beachwear and never got around to it because I was too busy. The ‘Hoff’s Day Off’ video is so fun, especially with the ‘Knight Rider’ and ‘Baywatch’ references and your singing. How did you enjoy incorporating your iconic career moments into this video? The [Happy Socks] guys are from Sweden, where I did my own television show, ‘Hasselhoff — en svensk talkshow,’ which was really like ‘The Dean Martin Show.’ It was a big, big success. It was up for a Kristallen award, which is [like a Swedish] Emmy. So I really fell in deep like with the guys. When I was shooting it, I was telling the guys, ‘let me play off the Hoff.’ ‘Knock Your Socks Hoff’ — ‘Let Hasselhoff Rock Your Socks Off’ — was going to be one of the titles of my last tour. So was just natural to come up with ‘Hoff’ stuff: ‘Taking a Day Hoff’ and ‘Happy Hoff.’ They were like, ‘Well, do whatever you want.’ So I did and they loved it. I sang ‘HOOOOFFFFF’ [in a booming operatic voice] and ‘taking the day Hoff.’ I was dropping my red shorts putting on the polka dot ones. Basic ideas of what to do. How do you like to wear your Happy Socks? To be honest, they go with everything. I just wore them on stage. I was [singing in front of] 65,000 people at a place called Gelsenkirchen for a ’90s concert and I had my white tennis shoes on and my Rolling Stones Happy Socks. Because I know The Rolling Stones. And — ha! — I thought, ‘Well, this could be a good thing for my concert.’ I mean, The Rolling Stones do 65,000 every night, but not me. So I went out to be the headliner to 65,000 people and was wearing Happy Socks. So it made me feel good. You do a great job of mixing prints and color in the campaign. What’s your advice for someone who’s afraid to play with color and pattern with their summer wardrobe? My advice is to just have fun and to live your life and to be a person. I don’t really think about putting them on. I don’t think about, ‘Okay, if I’m wearing black, I better wear something black and pink to match.’ Just grab ’em and go! I’m going to the gym now and I’m going to be wearing a pair of short workout Happy Socks and they get a reaction no matter what. People come up and they say, ‘love your socks’ you know? [guffaw laughs] Like everyone thinks it’s funny because they get a reaction. It doesn’t matter about mixing colors. Put on the socks and go for it and you’re going to get a reaction from people. Even if you don’t get a reaction, you get a reaction from yourself when you look down at your socks. You just go, ‘Those socks are ridiculous. Why am I wearing them? !’ They’re fun. That’s true. It’s also a way to sneak in some fun if you have a super corporate wardrobe or want to send a subtle message with your outfit, too. Yeah, I know. I was wearing Andy Warhol underwear the other day and I was walking around going, ‘I wonder if anyone knows that I’m wearing Andy Warhol underwear?’ Pretty soon I’m going to have my own underwear with my own Hoff face. I already have — fans come in line and they have like bikini underwear with ‘David Hasselhoff’ right in the front. It’s a little bit embarrassing and then I say to the guy, ‘you know, that was pretty wild underwear.’ He goes, ‘I never take them off!’ and I went, ‘okaaay, okaaay.’ It’s very weird to see my face on the crotch of a big guy. I think Hoff socks with my face on them [would be fun]. ‘Don’t Hassel the Hoff‘ — that’s my biggest selling t-shirt and people love it. I gave a lot to the crew when I was there shooting with the people that make Happy Socks. Wearing socks with sandals can be polarizing. What would you say to the naysayers? Do what you want in life, right? And if you want to wear socks and sandals, wear socks and sandals. You’re not going to get a reaction that’s negative. It’s just so funny. It’s really funny to wear socks and sandals. It was the first time I ever did. I went, ‘oh my god, this is kind of hilarious.’ It is hilarious. It’s comfortable, it’s fun. It’s just about being yourself and having a laugh and brightening up your day. It’s same thing as going to the beach. So, if Michael Knight and Mitch Buchannon wore Happy Socks, what prints would they choose? Wait, does Mitch wear socks? No, that’s why I don’t have the answer to that question. With Michael Knight, you would never see the Happy Socks because he always wore boots. With Mitch Buchannon, he always wore thongs. But if obviously, if Mitch Buchannon was to wear something, they would be the colors of ‘Baywatch,’ which are orange, yellow and bright red and then with ‘Knight Rider,’ it would definitely be black and red. It would be something a little bit more subtle and a little bit more cool. Then ‘Baywatch’ — absolutely whatever you want it to be because it’s always — well, not always — but usually always bright and sunny at the beach.